“It’s a beautiful day! Today I start my new workout routine. I’ll get up at 6am before the kids wake up and – oh, it’s already 6:30am. Well, that’s okay. I still have time to read my Bible for 20 minutes. Nope, that’s the baby crying. Okay…I know! While I feed the baby I will begin my “One Month of Pinterest Meals” menu plan. If we’re not careful the foundation of our motherhood can quickly become one big self-improvement plan. If you’re a mom you take your job very seriously – as you should! But while all these activities might be good things, we have to remember they have nothing to do with the gospel. Why bother making that distinction? Because moms have a tendency to make these issues into spiritual issues. We make judgments on ourselves (and others) based on how well we accomplish the tasks mentioned above. Since when did our identity ever depend on the quality of our cake-pops? When we place so much importance on how we perform each day that our very joy depends on it, we’ve crossed the line into making it a spiritual issue. At the very core of our self-expectations and criticisms is what many theologians have identified as the biggest threat to the gospel itself: Legalism. Briefly defined legalism is seeking righteousness, approval, and acceptance from God based on works. “I’m not trying to work my way to heaven by being a good mom!” you might scoff. But how about working for peace? Working for God’s love and acceptance? Working for an emotional sense of security? Christ bought all of those things for His children. In Christ they are yours – right now. In fact, grace and peace are yours to the fullest measure in Christ (1 Peter 1:2). So why do we constantly slip back into legalism? To the world (and unfortunately to Christians at times) the gospel seems too simple. It needs help. It needs some pizzazz. So we pour all of our energy into life improvements: a better marriage, well-behaved kids, a more organized house, a better physique. We get so distracted by results (or lack of results) that we don’t realize we’ve stepped away from the root source of our strength – Christ Himself. Paul recognized that nothing needed to be added to the gospel. In 1 Corinthians 2:2 he said, “For I determined to know nothing among you but Jesus Christ, and Him crucified.” Put the gospel first and let everything else flow out of it. What does it mean to put the gospel first? Sinclair Ferguson said that saturating our minds with the gospel means to “expend our energies admiring, exploring, expositing, and extolling Jesus Christ.”2 Jesus isn’t just our model for obedience, He is the fulfillment of our obedience. He succeeded where we fail. If you trust Christ as your Savior, study His righteous life – it’s yours! Ponder His beautiful relationship with the Father – it’s yours! “Are you saying we shouldn’t try to do our best as moms? We shouldn’t aim for high standards?” No. A true understanding of the gospel doesn’t get us off the hook for obedience. It fuels it. Remember, we love because He first loved us (1 John 4:19). Put Christ first. And then…do whatever the heck you want with your mommy list. Run for five miles a day, make a three course dinner every night with produce from your own garden – or don’t! All to the glory of God, who is already pleased with you because of Christ. Grace is at the heart of our motivation to obey. When you fall into bed at night desperately wanting a do-over of the whole day, stop and ask yourself why you are in despair. Is it because you failed to live up to your standards? Sorry – there is no solution for that. Or is it because you sinned against your loving heavenly Father? There is a solution for that. There is forgiveness at the cross. His mercies are new every morning (Lamentations 3:22-23). Legalism motivates through guilt. The gospel motivates through love. We see how much we have been forgiven and the freedom fills our hearts with fresh motivation to obey. Charles Spurgeon said, “Here’s pardon for transgressions past, it matters not how black their cast; And, O my soul, with wonder view – for sins to come, here’s pardon too!”3We are no longer obeying foracceptance, but becauseof acceptance. What about you? 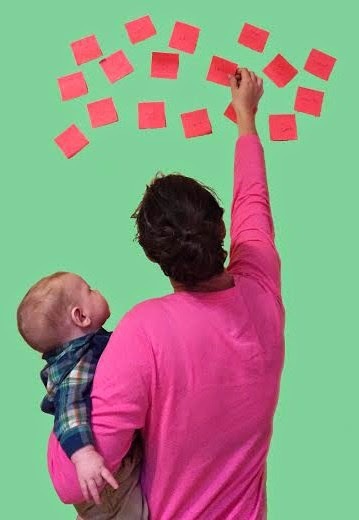 What are some of the #1 things you think moms put on their “self-improvement” plans? Do you see any non-spiritual issues we have turned into spiritual issues? Lloyd-Jones, Martin David. Spiritual Depression: Its Causes and Cure. Eerdmans Pub Co.
Mahaney, CJ. The Cross-Centered Life: Keeping the Gospel the Main Thing. Random House LLC. 2009. Spurgeon, Charles H. Sermons Delivered in Exeter Hall, Strand. London, 1855. Your thoughts are so concise and so full of the grace God has given you. It is evident that you are reveling in who Christ is for you, not who you are for others or for your kids. Such a great example for me, as your “little” sister. I read each blog post as a teacher and wife, and get just as much out of it as these moms! Praise God. Great post, Sara! I usually “need” to accomplish a certain amount of things a day to feel like it's a successful day and I'm a successful person. I really have to re-think that mentality- especially as a mom. As I teach my kids what I KNOW to be true, I hear myself and think, “wow…how much better will my daughter learn these truths if I'm living them out in front of her.” Being a mom is the most humbling experience (for so many reasons…)! So humbling. Which, I have to remind myself, isn't a bad thing. 🙂 Thanks, Margaret! How do you learn to think and live gospel? Quinn, that is such a good question. It all starts with fixing our eyes on Jesus – Who is He? What did His life, death, and resurrection accomplish for me? How does God see me now that I am in Christ? Often as Christians we approach life with the question, “What does God want me to do?” It's not a bad question, but it has to be rooted in, “What has Christ ALREADY done for me?” It lays a foundation of hope, giving us fresh motivation to follow God. When your heart is anchored in this grace it will flow through you to others. This kind of thinking is a daily discipline because our flesh will fight it. If you have any more questions I'd love to talk to you about it. Let me know. First of all, I almost laughed out loud at the sentence about our identity depending on the quality of our cakepops. If you could have seen me last weekend at 10 pm on a Friday night after a long exhausting week desperately trying to make frosting and sticks stick into cakepops and FAILING – not only the make the cakepops look nice but to handle their lack of niceness with any sort of grace, perspective or humor – you would know exactly why that sentence hit home! Second – your words help me realize that I am constantly failing at my own standards and refusing to forgive myself for doing it. Maybe I can start changing my habits my taking that itself to Jesus and saying I'm sorry for living by my standards instead of yours. Please forgive me and help me to instead live under the banner of you being *already* pleased with me. Kt, that's hilarious! It just proves that we truly are in this together, experiencing all the same things. Living according to God's standards brings true freedom because there is an instant remedy for when we fail – forgiveness. Paul didn't try to make excuses for his failures. He claimed them with confidence because he knew his failures put God's glory on display: “When I am weak then I am strong (2 Cor. 12:10).” Praise God for new grace every day.